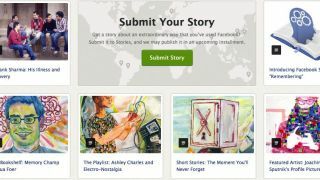 An independent destination, Facebook Stories aims to "share the stories of people using Facebook in extraordinary ways." "This site will share some of the most extraordinary, quirky and thought-provoking stories and ideas from the more than 950 million people around the world who comprise the social graph," explains Johanna Peace, a Facebook spokeswoman. With a magazine look and documentary-style format - with undertones of Timeline - the site explores stories centered on a different theme each month. This month's it's "Remembering." Highlighted on the site is the saga of Mayank Sharma, a New Delhi man who lost his memory after contacting meningitis. In a two minute-plus video, Sharma says he woke up one day and "remembered nothing," losing 27 years of memories and people. Thanks to Facebook's "People You May Know" feature, Sharma's been able reconstruct some pieces of his life lost to the disease. Sharma's not the only featured Facebooker up now and anyone can submit their stories (after accepting a Facebook Stories app), though final selection is left to the Facebook team. According to Peace, Facebook hopes that by spotlighting the stories of its users, people can connect and share innovative ways to accomplish the impossible. "We hope to inspire people to find new uses for these technologies within their own lives," she said. Stories also includes a Bookshelf feature, a list of "Goodreads" to help users "dig deeper into each month's theme." Another literary element, the Reading List, gives exclusive access to magazine, newspaper and other publications' archives, like pieces from The New Yorker up now. A Spotify-powered Playlist curates music from various, genre-hopping artists. On the site now is a Playlist of tunes inspired by Gameboy games. Finally, Peace said Facebook has created an infographic based on each month's theme, examining the major life events from around the world posted on users' Timelines. For "Remembering," a graphic representing major milestones like travel, moving, marriage, dating and birth was created. Travel, it turns out, is the top milestone making it's way onto users' profiles, with older people posting more travel stories. Canadians apparently share their travel stories with more people than in any other country. Teenagers, unsurprisingly, post the most about their relationships with Turkish citizens sharing the most New Relationships, Indonesian residents posting the most engagements and people in Brazil the most marriages. According to Peace, "getting glasses" is a major life event in Japan with the country posting more stories about this than any other.